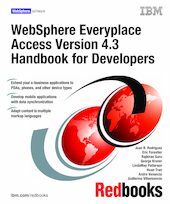 This IBM Redbooks publication helps you plan and develop mobile applications to run in a WebSphere Everyplace Access Version 4.3 environment. The information provided in this book targets business-to-employee (B2E) enterprise applications, but most of the scenarios presented will apply to business-to-consumer (B2C) applications as well. In this book, you will find step-by-step examples and scenarios showing ways to integrate your enterprise applications into a WebSphere Everyplace Access environment using the WebSphere Studio Site Developer and the Everyplace Toolkit as well as extending your portlet capabilities to use other advanced functions such as Transcoding Technology. You will also find numerous scenarios describing recommended ways to develop and implement server-initiated actions, Everyplace Client security and others. This book includes sample scenarios describing ways to implement Intelligent Notification Services to notify Lotus Sametime, SMTP e-mail, WAP devices and others. It also includes scenarios illustrating the new Location Aware Services (LAS) function to provide access to location-based services from multiple vendors using the available APIs. Sample scenarios will also include offline applications using Offline Portal Content and Forms, DB2e applications and Relational Database Synchronization with JDBC back-end databases, PIM and e-mail synchronization with Domino and Microsoft Exchange servers.